Let's Talk Gutters - Lambert Investments Inc.
We all know the obvious reasons that gutters are necessary, keeping the rain off your head as you exit your home or office and giving dads the world ‘round a reason to despise leaves. However, is there more to gutters than this? Actually, yes. While not have rainwater running off the roof down on your head is a compelling reason, if this was the only purpose of gutters, you really wouldn’t need to have them located anywhere else except at doorways. So why are gutters so important? When you look at it, water is an incredible force; one only has to look at what the Colorado River created with just an inch of rain a year, the Grand Canyon! Consider this. An inch of rain on your average 2,000-square-foot home produces 1,200 gallons of rainwater. Now imagine what kind of damage that much water can do to your managed properties if not adequately diverted. Clean Gutters: Check gutters regularly to make sure they are clean, and remove any leaves or other debris.It is not enough to have gutters and downspouts on your property. It is also essential to make sure they are in good condition, have the correct pitch off the roof and slope appropriately so the water moves quickly away from the structure and properly maintain these throughout the year. 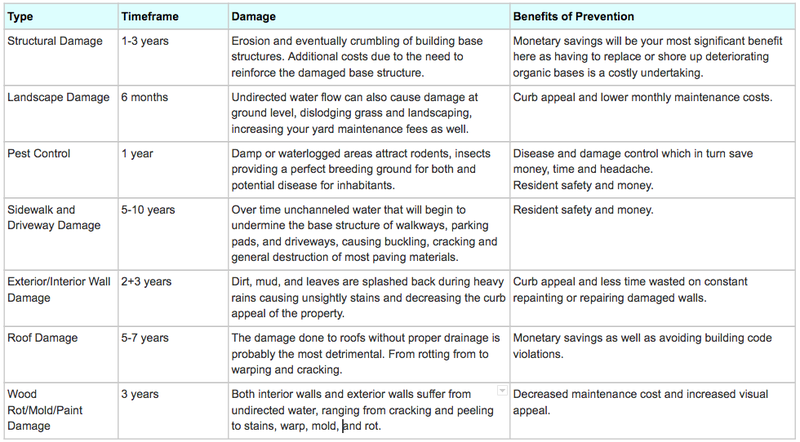 Here is a basic checklist for maintaining your property’s gutters. Repair Downspouts: Make sure that downspouts are clear of leaves and other debris, and that any joints fit together correctly.